Crystal Simple Green Industrial Cleaner and Degreaser is a powerful, industrial-strength cleaner and degreaser formulated for critical cleaning applications that demand high performance from a fragrance and color-free solution. This highly-trusted cleaner utilizes an orally non-toxic, non-flammable and biodegradable formula, making it the ideal cleaning solution for a variety of industries where sanitation and safety are of equal concern. Clean-rinsing, concentrated and cost-effective, Crystal Simple Green is the sound choice for food processing & handling, industrial, manufacturing, electronics and parts washing industries, cutting through tough grease, oils, built-up grime and other residue without harsh or volatile chemicals. The formula is NSF labeled A1, A2, A4, A8, B1 and C1 for use in commercial kitchens, food processing plants and other areas where food is prepared or handled. It is able to validate below 10 parts per million in rinsability requirements for cleaning in cosmetics, medical and pharmaceutical environments where Good Manufacturing Practices (GMP) are followed. OSHA exempt from special handling and personal protection requirements, Crystal Simple Green is a safer alternative to caustic cleaners and solvents. 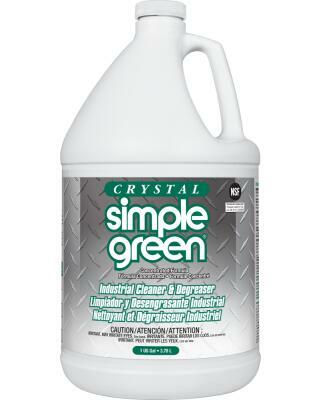 Crystal Simple Green Industrial Cleaner & Degreaser is a highly versatile cleaning and degreasing with no added color or scent. Can be used full-strength or in various dilutions on water-safe surfaces, including metal, concrete, rubber, synthetic and plastic. NSF registered for use in food facilities.